November housing statistics for Fairfax County, Virginia have been steadily improving for sellers. If you are thinking of moving to Northern Virginia then you might want to move fast. Just in November prices went up 6.3% from November 2016 and year to date change of 4.2% overall. Closed sales are well above the 5 year average for the months in November, with 2017 being 159 more homes than the 5 year average. The competition for home sellers is low at the moment, with the supply at 1.7 months. Sellers and buyers bridging the gap on buying (or sold) v. what the house on listed for in Fairfax County indicated by the sales prices, 97.2% of the asking or list price. For instance if a home is on the market and the asking price or list price $400K than the statistics show that on average that home in Fairfax County will get 97.2 % or $388,800 which is a difference of $11,200. The past 5 year average is 96.7% which on the same scenario would net $386,800, is $2200 less than today. 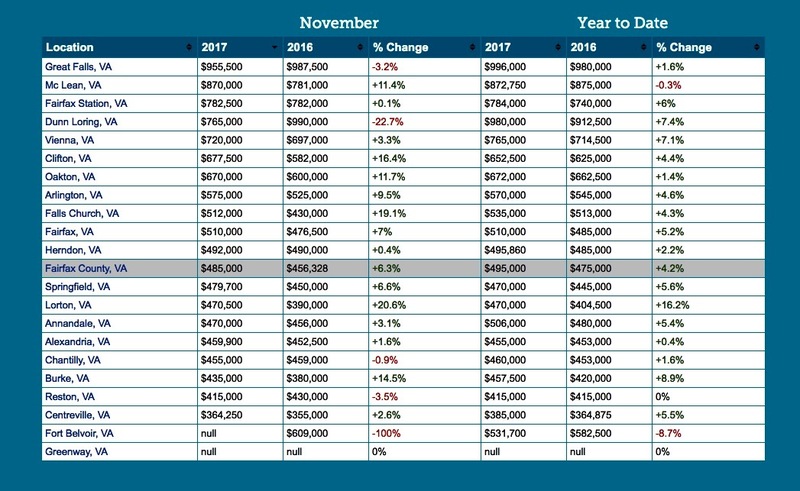 The median”sold” price of a home in Fairfax County Virginia in November came in at $485,000. up 6.3% from the same month last year and the year to date median “sold” price is $495.000.